Beautiful, well maintained, country home in the small village of Belwood in a quaint subdivision, yet only a short drive to Fergus, Guelph or Orangeville. Spend the day fishing or boating in Belwood Lake, take a stroll or bike ride on the 47km. Cataract trail, then come home to an invigorating game of badminton or horse shoes. 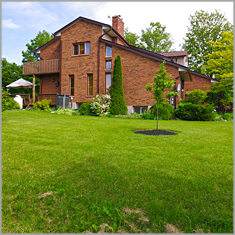 Later, relax in the peaceful backyard, surrounded by trees and perennial gardens. Enjoy the evening roasting marshmallows by the fire and listening to the songs of the birds. All this, and only 1 hour from Toronto. This house is a must for the outdoor enthusiast and is an entertainer's delight. Quality and pride of ownership is evident in this 3 plus 1 bedroom home, with cathedral ceilings in the foyer, living room, master bedroom and 2nd bedroom. This home welcomes you with all the ambiance of oak doors, oak trim, oak stairs and oak floors and stone and brick fireplaces. The bright and open eat-in kitchen overlooks the serene backyard and is open to the family room. The separate dining room is a great place for those special occasions with a brick fireplace and French door to the deck. The main floor laundry room with door to the deck and garage and 2 closets is a bright and spacious place to do laundry. The oversized master bedroom is a retreat for anyone, with its cathedral ceiling, sliding door to private deck, relaxing ensuite with soaker tub and separate shower and more closets than one could ever dream of. The finished basement is a bonus with an additional large, bright space for entertaining with its large recroom, pool table area with wet bar, exercise area, 3 pce bath and 4th bedroom or office. No cost was spared when building this home - 2x6 construction, 95% brick, central air, central vac, high efficiency heating system, security system. Go to www.virtualtoursgta.com/vt/belwood/richard-bye/35-amalia-cr/ for a virtual tour of this beautiful home waiting to be called yours. Main Level - 1125 sq. ft.
Upper Level - 1022 sq. ft.
Master Bedroom with Five Closets and Dressing Area- 13ft x 32ft Bedroom has cathedral ceiling with wood beam, hardwood floors, sliding door to deck, ceiling fan and a 3 ft. closet. Dressing area has two 5 ft. closets with organizers, one 3 ft. closet, one walk-in closet, hardwood floors, cathedral ceiling, 7 ft. window and ceiling fan. Ensuite 9.5ft x 11ft Newly renovated featuring a separate shower with travertine tiles, large whirlpool tub surrounded by travertine tiles, oak vanity with granite counter top and linen closet. Lower Level - 1125 sq. ft. Call Richard Bye at 519-400-4139 for all showings.